MCH Programs are accountable for continually assessing needs, assuring that services are provided to the MCH population, and developing policies that are appropriate to identified needs. The MCHB cycle of performance and accountability begins with a needs assessment and the reporting of health status indicators, which indicate where the greatest program needs are. Once the needs are determined, the State and Federal MCH programs determine program goals and priorities based on needs. Agencies then allocate resources to those priorities, indicating which types of MCH programs will be resourced. 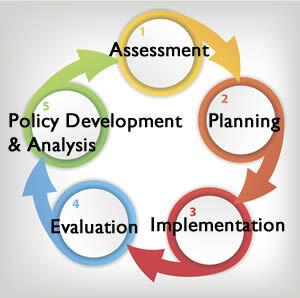 Evaluation is critical to MCHB policy and program development, program management and funding. Findings from program evaluations and performance measurement become part of the ongoing needs assessment activities and inform efforts to influence policy for systems improvement. Assessment includes engaging stakeholders, data collection strategies, needs and gaps analysis, and priorities. (MCH Leadership Competency 1K4). Program Planning incorporates learning topics like evaluating scientific evidence, logic models, writing program objectives, capacity assessment, and consensus building. (MCH Leadership Competency 11S1). Program Evaluation includes topics like selecting appropriate evaluation designs (e.g., process v. outcome), impact assessment, cost-effectiveness analysis, etc. (MCH Leadership Competency 1S4). Policy Development and Analysis covers basic refreshers on civics (governmental structures and processes), policy analysis, administrative policy processes, communicating with policy makers, and more. (MCH Leadership Competency 12).